Long-term dividend growth may not be the best metrics to use to compare dividend stocks. Reviewing yearly dividend increases can identify great dividend growers that have done so over many consecutive years. 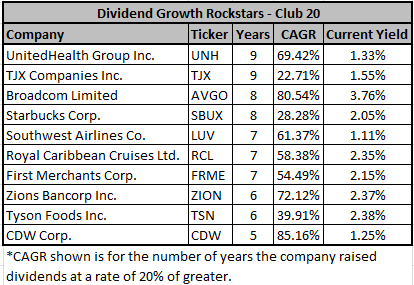 UNH and TJX currently hold the best streak of consecutive dividend growth of at least 20%. A very important metric all dividend investors pay attention to is dividend growth. And rightfully so, because it is through growth that our income streams increase and the true power of compounding happens. While some of us chase higher yields and settle for smaller growth, everyone loves to see those large dividend increases. But what is better than seeing large dividend increases? Seeing consecutive large dividend increases! In order to find the best consecutive dividend growers, we must look beyond the standard 1-, 3-, 5- and 10-year dividend growth rates that may not accurately reflect the actual dividend growth history for a stock. Investors often reference the 10-year dividend growth rate because it offers some insight to the long-term dividend growth history for a stock. However, it can often make two companies look equal when in reality they are not. Let me offer an example to show you what I mean. Two great dividend growers that all investors know, Walgreens Boots Alliance (WBA) and Hormel (HRL) have both rewarded investors with dividend growth for many years. Their current 10-year dividend growth rates, from the latest CCC list, are 15.01% for WBA and 15.02% for HRL. Looking solely at this rate we can imply that dividend growth for both companies has been very similar over the last decade. Take a look at their actual dividend history for the last decade in the image below. Image Source: self-created using data from CCC list. Dividend growth for HRL has jumped around quite a bit, but they have maintained at least double-digit growth since 2010. Additionally, their running 5-year CAGR has remained steady, hovering around 17%. WBA, on the other hand, has seen a decline in their dividend growth, with the last four years in single digits. Their 10-year growth rate is overly inflated by significant increases between 2009 and 2013. Additionally, their 5-year CAGR has been declining significantly since 2014. You can see that while the 10-year dividend growth for both companies is similar, their dividend history over that period of time is quite different. 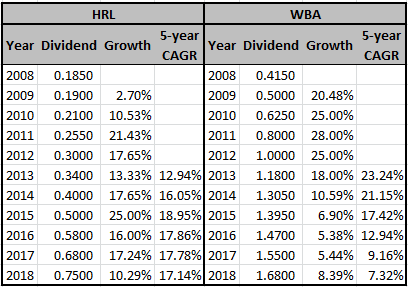 One way to see that HRL has outpaced WBA in recent years would be to review shorter dividend growth rates. Another option is to look at their 1-year dividend growth rate for each of the last 10 years, and this is exactly what I have done. Except I looked at all the companies on the CCC list and I looked at the last 19 increases. Reviewing 1-year increases for the over 800 companies on the CCC list, manually, would take way too long, fortunately, excel offers some neat formulas to expedite this process. With one formula, I was able to see the number of consecutive years each company has raised their dividend for my desired growth rate. I decided to start my search with a 20% growth rate; while it may be high, you will be surprised how long a few companies have been able to sustain such growth. Additionally, if two companies had an equal number of consecutive growth years, I decided to make their compounded growth over that period as the tie breaker. Here is the list for February 2019. UnitedHealth Group (UNH) and TJX Companies (TJX) lead the pack with 9 years each, quite impressive. Here are their dividend histories to paint a better picture of their last 9 dividend increases. 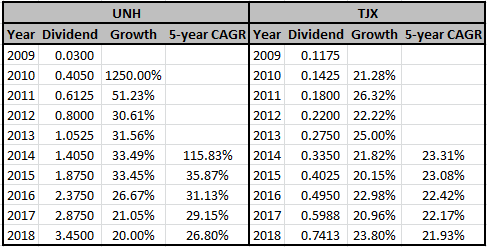 UNH’s dividend increases have been slowing down steadily with the last increase in 2018 at an even 20%. It will be interesting to see whether or not they can continue their at least 20% growth in 2019, their increase is expected with the June dividend. TJX, on the other hand, has been hovering over 20% growth steadily since 2010. Their next increase will also come in June of this year, and I think due to their steadiness, they have a better chance to continue their high growth. 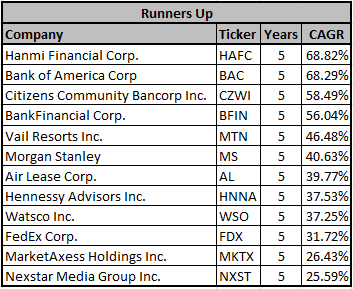 Here are a few of the runner-ups who also have a streak of at least 20% dividend growth for 5 years, but lost on CAGR to CDW, and therefore did not make the top 10 list. Be careful comparing companies on long-term growth metrics alone because they may lead to bad conclusions. Dividend investors chasing high growth should look for steady consecutive growth over long periods of time. While the 20% growth I discussed in this article is great, it may not be the best target to aim for. The chances a company can sustain such high growth over a long period of time is rather low. Many of the companies in my top-ten list have only recently started paying dividends to investors, and it is much easier to achieve high growth early on. I intend to continue to update this list as the year goes on to see if UNH or TJX can extend their streaks to 10 years. I also intend to publish additional lists showing consecutive growth of at least 15% and 10%. I expect the lower growth metrics to include more mature dividend paying companies and not so much highlight companies with short dividend growth histories. Disclosure: I am/we are long TJX, SBUX, LUV, FDX. I wrote this article myself, and it expresses my own opinions. I am not receiving compensation for it (other than from Seeking Alpha). I have no business relationship with any company whose stock is mentioned in this article.